Meeting your companions for a fun informal breakfast at that new, neighborhood eatery? 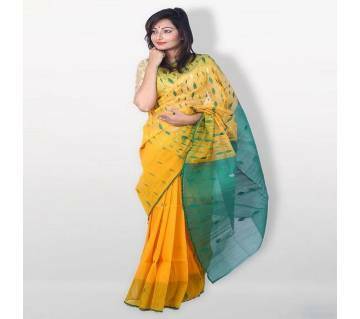 Wear a mint green and lime yellow Jamdani saree with an orange outskirt. Meeting your sweetheart's folks out of the blue finished supper? Worry not and choose a flushed pink Jamdani saree with a white woven outline all through. You will be okay and establish a stellar first connection. It is safe to say that you are an admirer of monochrome? Pick a highly contrasting Jamdani saree with theoretical outline plan everywhere. Wear it to work and feel great when the compliments pour in. Jamdani sarees started in Dhaka, one of the greatest weaving focuses of then Bengal – it is outstanding amongst other muslin materials of the locale. The name Jamdani came to fruition from the mix of two Persian words, specifically 'Stick' which means blossom and 'Dani' which means a vase or just, a container. This was named after the wonderful botanical examples that were found in the Dhakai workmanship (otherwise called Dhakai Jamdani). The most punctual records of the compelling artwork were found in Kautilya's popular Arthashastra. Jamdani sarees today are thought to be the best bits of ethnic apparel – they include meticulous, work concentrated exertion and take longer to deliver. Bangladesh has got thousands of years of tradition regarding dhakai jamdani sarees and the uses of those traditional sarees began during the Mughal reign. By considering the weaving system of dhakai jamdani sarees, UNESCO has declared it as a Cultural Heritage. In the beginning, Jamadani sarees were known as Dhakai sarees, but by the process of time, the name ‘jamdani’ was formulated. ‘Jamdani’ is a Persian word which was formed by the combination of ‘Jam’ (flower) and Dani (a vase or a container). Dhakai Jamdani saree is unique and very exclusive in design and extensively throughout the whole country. 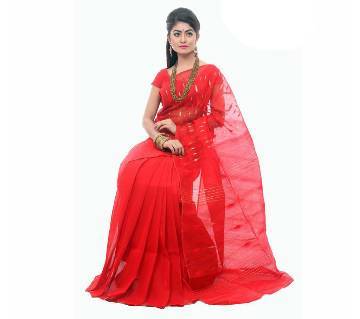 AjkerDeal brings some of the best jamdani saree collection in Bangladesh at an unbelievable price. Jamdani saree is kind of dress you can wear on a regular basis as well as on various occasion. This jamdani saree makes a great combination of beautification among the women and they look stunning in this outfit. In Bangladesh, Dhakai Jamdani sarees are very much popular among women. The popularity of dhakai Jamdani sarees is not limited within the boundary of Bangladesh rather than it has earned immense popularity all over the world. Considering the demand of dhakai jamdani sarees, the largest online shopping site of Bangladesh, ajkerdeal.com has decorated its saree category with a number of high quality dhakai jamdani sarees. There are varieties in their design, color and price range. Ajkerdeal.com is not just only conscious of the ongoing demand of the customers but also they are very much aware of the promotion of the traditional heritage of Bangladesh. You can buy your favorite dhakai jamdani sarees from this renowned online shopping platform of Bangladesh within a couple of mouse clicks. dhakai Jamdani sarees are worn on various occasion and they are also very comfortable to wear as well. Bangladesh has got several occasions like Eid, Puja, Pahela Baishakh, pahela falgun, Valentine’s Day and so on. Dhakai Jamdani is also known as a favorite gift item for so many people. A perfect marriage ceremony cannot be considered without the presence of Jamdani sarees. On the other hand, jamdani sarees are also used in programs like birthday and others. The largest online shopping site of Bangladesh, ajkerdeal.com, has got different type’s women fashionwear-just check it out & order your favorite jamdani saree online from ajkerdeal.com. 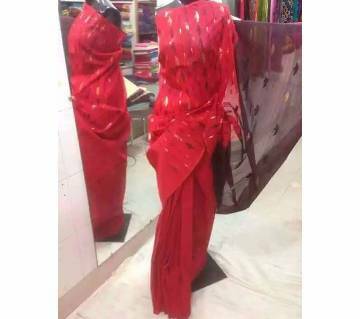 Finding out the best jamdani saree seems a hassle to find out but Ajkerdeal makes it very easy for the entire jamdani saree lover because your perfect jamdani is just one click away. Find out your desired design and collect from AjkerDeal and just place an order online to grab your perfect saree delivered to your home.